Don't waste your time installing an old worn-out oil pump when you can get one of these brand new Melling OEM replacement oil pumps at such a low cost. These pumps are manufactured from high-quality steel with all-new components and are individually hand-turned and pressure-tested to guarantee they'll perform as good as OEM. Blueprinted pumps also available,Work is done on Main oil feed and bypass area of pump to eliminate any cavitation heat while improving flow from those areas. Constructed out of high quality brass for optimum heat dissipation they have a 3" x 12" core. And feature 1" NPT water fitting ends & 1/2" NPT fittings for oil inlets and outlets. Zinc Additive 4 oz Bottle. Will treat 5 Qts of oil and keep your flat tappet cam alive. Heavy duty Jabsco pump, oil changer Bucket. 16qt bucket, 6’ power leads, with integral On/Off switch. 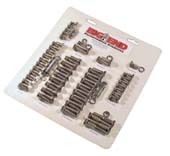 Stainless-steel hex cap bolt kit. Why use you rusty OEM bolts? Each kit includes: Intake manifold, valve cover, filler neck, timing cover, fuel pump, distributor hold-down, water pump, oil pan and header bolts. 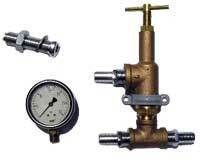 High flow marine thermostats designed to help maintain constant temperature. Choose 160 degree or 180 degree. Allows equal amounts of water to flow to exhaust manifolds or elbows. Ideal for Jet boat applications. This water Divider is a must have on all V-8 applications. 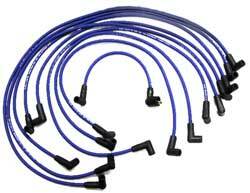 It distributes an even flow of water to both sides, can be used for engine cooling or exhaust cooling. The inlet is tapped for 1/2" NPT and the outlets are for 5/8" hose. 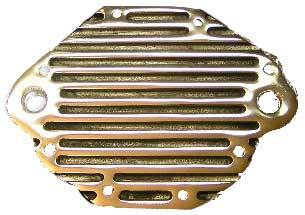 Designed to prevent blown head gaskets or leaking solid copper head gaskets. Allows you to add up to 20’ degrees to your operating temperature. Maintains full water flow to engine, bypassing to a thru-transom fitting (hose not included) if pressure becomes excessive due to high RPM. Fits under Holley 4150-4160 carbs. Includes 33c 6 hole cable clamp. Bracket is Chrome plated steel, and mounts on carb stud for a clean look. Fits Holley 2300/4150/4160 Carburetors. Filter element are available from 2.0", 4.5", 10.5" tall. Stainless Steel cover, 9 in. Diameter, For 5.125 inch inlet carburetors . High performance marine flame arrestors. These K&N marine flame arrestors feature a unique oiled cotton gauze and epoxied screen filter element. Through test after test, they have withstood a wide range of marine punishments: backfire, vibration, moisture, salt spray, rust and corrosion. They satisfy Coast Guard regulations while offering critical engine protection. Who could ask for more? * Metal canister is encased with epoxy to protect the windings from high vibration applications * Improved output coil for electronic ignitions, and MSD Ignitions (ballast resistor required for points) * 100:1 turns ratio and lower primary resistance produce high voltage output * CARB E.O. Approved In applications such as off-road, marine or other harsh conditions, the MSD Blaster High Vibration Coil is the best choice. The sturdy metal housing of the High Vibration Coil is completely pot­ted with a premium grade epoxy to completely encase the coil's primary and secondary windings. This protects the coil's internal components from high and low frequency vibrations that are commonly experienced in racing. * Multiple spark, capacitive discharge ignition control * Designed for marine use and is UL approved * Unit is completely potted with Ciba polyurethane compound * Weathertight connectors are used to make the electrical connection * Built-in rev-limiter, Adjustable with chips * Multiple sparks for 20 degrees of crankshaft rotation * Works on 12 - 18 volt electrical systems * Accepts breaker points, amplifier and magnetic pickup trigger inputs * 470 primary voltage output to coil * 110 millijoules per spark up to 15,000 RPM * No programming required. The 6m-2L can be triggered by either a magnetic pick-up (distributor or crank trigger), amplifier or by a breaker point distributor.